In our eyes, we think that there’s no better place to gain interior inspo than over on Instagram. Hands up 🙌🏼 if you’ve lost hours of your time falling down that rabbit hole? Stumbling across pages and pages of beautiful home interiors, clever ideas, and stunning flat lays that soon have you planning a complete refurb of your home...don’t worry, we've been there too! So, we thought we’d show you some of our current Insta faves… the one’s that we’re swooning over with their dreamy interiors and crafty ways. Tamsyn is an interiors blogger, freelance stylist with a HUGE passion for all things floral. 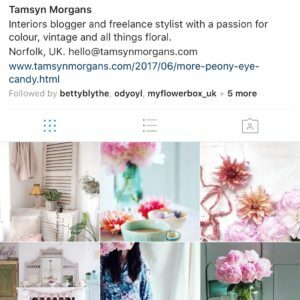 If you love pastel shades, beautiful blooms, and petal-filled flat lays then make sure you check out Tamsyn’s Instagram feed. It’s what floral dreams are made of. 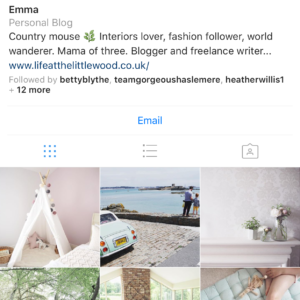 Emma describes herself as a country mouse, she has a serious love of interiors and the most gorgeous blog. Her blog is a mixture of her family life, home interiors, and elegant-girly styling. Making you wish you could just run off to the country and take a big deep breath. 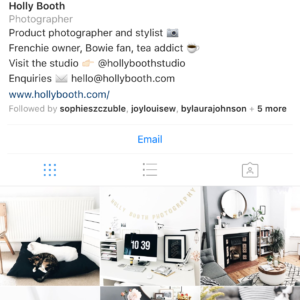 Product photographer and stylist, Holly Booth, has such a gorgeous eclectic style that is a big shout to the monochrome lovers ◼️ ◻️ out there. And you’ll find plenty of pictures of her gorgeous frenchie and copious cups of tea. Florist and interiors lover, Style the clutter, has such a serene sense of style making you want to relax and unwind in her dreamy interiors. She’s also over @harpersbloom which is all about the flowers (occasionally styled in a variety of our vases and jugs). 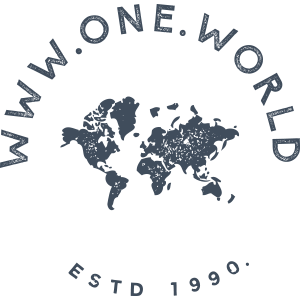 Make sure you check out these stylish accounts, and don’t forget to follow us too @onedotworld. And, we’re always on the lookout for more swoon-worthy style so let us know your Insta faves too! 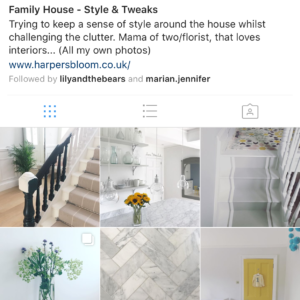 Instagram faves: Interior Designers We share five favourite Instagram accounts we love to follow. This post the focus is Interior Designers.